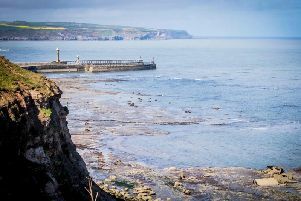 A rare fossil found off the coast of Whitby contains the skeleton of a pregnant sea beast dating back to the dinosaur age, paleontologists have discovered. The ichthyosaur, estimated to be 180m years old, has been in the collection of fossil collector Martin Rigby since it was found in 2010. His suspicions about what it might mean have now been confirmed by palaeontologists from the University of Manchester, with the skeleton holding up to eight tiny embryos. This discovery, the first of its kind in Yorkshire, is now to go on display at the Yorkshire Museum’s new Jurassic Yorkshire exhibition in York. Palaeontologists Mike Boyd and Dean Lomax said only five specimens had ever been found in the UK containing embryos, and none with this many. Sarah King, curator of natural science at the Yorkshire Museum, said: “This is an incredible find and the research by Dean and Mike has helped us confirm it is the first example of fossilised ichthyosaur embryos to be found in Yorkshire. “Its display in Yorkshire’s Jurassic World incorporates the latest digital technology to reveal the embryos and to explain the significance of the discovery. Ichthyosaurs were aquatic reptiles that dominated the Jurassic seas. They gave birth to live young, rather than laying eggs, and did not need to return to land, even to breed. They were carnivores, feeding upon other reptiles, fish, and marine invertebrates such as the squid-like belemnites. Ichthyosaur fossils are quite common in the UK and often found in British Jurassic rocks. The new study was published yesterday in the scientific journal, Proceedings of the Yorkshire Geological Society.